Terminal emulators may implement local editing, also known as "line-at-a-time mode". This is also mistakenly referred to as "half-duplex". In this mode, the terminal emulator only sends complete lines of input to the host system. The user enters and edits a line, but it is held locally within the terminal emulator as it is being edited and not transmitted until the user signals (usually with the ↵ Enter key on the keyboard or a "send" button of some sort on the user interface) the completion of the line. At that point the entire line is transmitted. Line-at-a-time mode implies local echo, since otherwise the user will not be able to see the line as it is being edited and constructed. However, line-at-a-time mode is independent of echo mode and does not require local echo. When entering a password, for example, line-at-a-time entry with local editing is possible, but local echo is turned off (otherwise the password would be displayed). 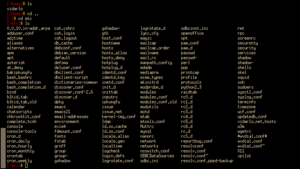 The complexities of line-at-a-time mode are exemplified by the line-at-a-time mode option in the telnet protocol. To implement it correctly, the Network Virtual Terminal implementation provided by the terminal emulator program must be capable of recognizing and properly dealing with "interrupt" and "abort" events that arrive in the middle of locally editing a line. In asynchronous terminals data can flow in any direction at any time. In synchronous terminals a protocol controls who may send data when. IBM 3270-based terminals used with IBM mainframe computers are an example of synchronous terminals. They operate in an essentially "screen-at-a-time" mode (also known as block mode). Users can make numerous changes to a page, before submitting the updated screen to the remote machine as a single action. Terminal emulators that simulate the 3270 protocol are available for most operating systems, for use both by those administering systems such as the z9, as well as those using the corresponding applications such as CICS. Other examples of synchronous terminals include the IBM 5250, ICL 7561, Honeywell Bull VIP7800 and Hewlett-Packard 700/92. Many terminal emulators have been developed for terminals such as VT100, VT220, VT320, IBM 3270/8/9/E, IBM 5250, IBM 3179G, Data General D211, Hewlett Packard HP700/92, Sperry/Unisys 2000-series UTS60, Burroughs/Unisys A-series T27/TD830/ET1100, ADDS ViewPoint, Sun console, QNX, AT386, SCO-ANSI, SNI 97801, Televideo, and Wyse 50/60. Additionally, programs have been developed to emulate other terminal emulators such as xterm and assorted console terminals (e.g., for Linux). Finally, some emulations simply refer to a standard, such as ANSI. Such programs are available on many platforms ranging from DOS and Unix to GUI operating systems such as Microsoft Windows and macOS, to embedded operating systems found in cellphones and industrial hardware. 1 2 Daintith 2004, p. 171. ↑ Weik 2000, "echo" p. 478. ↑ Weik 2000, "echoplex" p.479. ↑ Weik 2000, "echoplex mode" p. 479. ↑ Bangia 2010, p. 324. ↑ Stevens & Wright 1994, p. 413. ↑ Miller 2009, p. 590, 591. Daintith, John (2004). "echo". Oxford dictionary of computing (5th ed.). Oxford University Press. ISBN 978-0-19-860877-6. Miller, Philip M. (2009). TCP/IP – The Ultimate Protocol Guide. 2 – Applications, Access and Data Security. Universal-Publishers. ISBN 978-1-59942-493-4. Stevens, W. Richard; Wright, Gary R. (1994). TCP/IP illustrated. Addison-Wesley professional computing series. 1: The protocols. Addison-Wesley. ISBN 978-0-201-63346-7. Weik, Martin H. (2000). Computer Science and Communications Dictionary. 1. Springer. ISBN 978-0-7923-8425-0. Wikimedia Commons has media related to Terminal emulators.